Looking to carb overload? Japan’s got you covered. 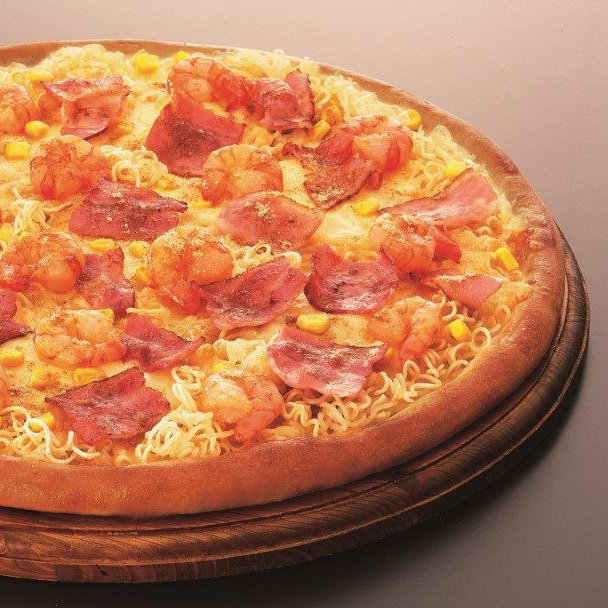 A pizza chain there has just introduced a ramen-topped pizza. As of yesterday, Aoki’s Pizza is serving up their “Kirin Ramen Pizza.” According to Rocket News 24, Kirin Ramen is a classic ramen brand, created in 1965, that is “a nostalgic Nagoya favorite”—referencing the city where Aoki’s is headquartered. An entire layer of these noodles is spread across the pizza crust, and then bacon, prawns and mozzarella cheese top things off. Need an additional ramen kick? The pie is also served with a soy sauce powdered soup packet. Because you can’t just throw the packet out, can you? A large version of ramen pizza will set you back 3,400 yen—or about $28. That price includes three cans of Coke so… I guess it’s a good deal? If that pie isn’t Japanese enough for you, Aoki’s is also debuting a “Gold Pizza with Okonomiayki”—or, basically, a pizza topped with a Japanese pancake. Sticking with the ’60s theme, I wonder if you can ask for vintage Speed Racer toys as an additional topping?